It’s finally summer in NYC and somehow spring came and went?! With these hot temps up to 95 degrees…you have to stay cool in more ways than one. This summer, I’m loving the white eyelet top. This one has a beautiful square neck-line (very on trend + flattering) and the cutest button detail. Guess where I got it….Forever 21! Shocking I know. This could be mistaken for a Reformation top which I’m obsessed with. Pairing something eyelet with your favorite pair of jeans adds the perfect feminine touch for the season. Accessorize with your favorite gold necklaces, an easy summer sandal and a straw bag and this outfit can take you from work, a date or a fun day with your girls. Here’s a few more styles I love for easy shopping by American Eagle, another American Eagle, H&M and another great H&M find. 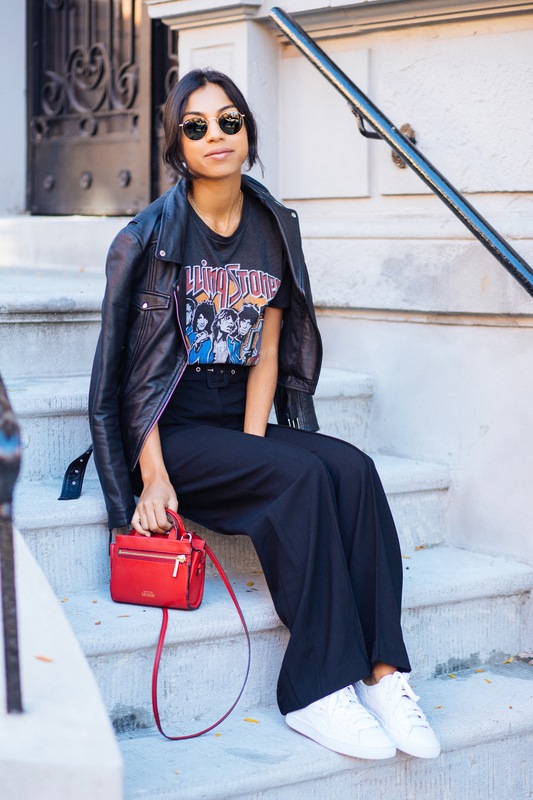 The rock tee trend isn’t going anywhere and I can’t get enough. Worn by top street style stars – my faves, Kendall + Gigi, this is the perfect way to add some vintage flare to any outfit. And it’s ok if you don’t know every song to the band’s name you’re wearing…but maybe at least google them so you’re not totally stunned when someone asks you, “What’s your favorite AC/DC song?” Lol. I was inspired by Gigi ever since I saw her wear this look; rock tee, amazing wide leg white pants and sneakers. 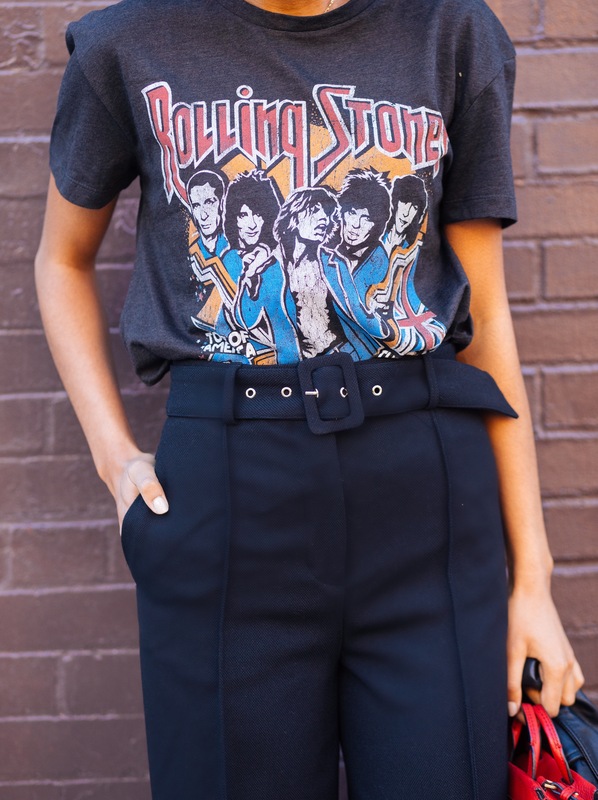 I love the unexpected wide leg pant with this tee. Sure denim looks classic with this top but something about a wide leg pant gives it an entirely different vibe. I found these amazing pants at H&M. I’m always a huge fan of anything high waisted and this pair had an ideal rise. I also love the oversized belt they came with! 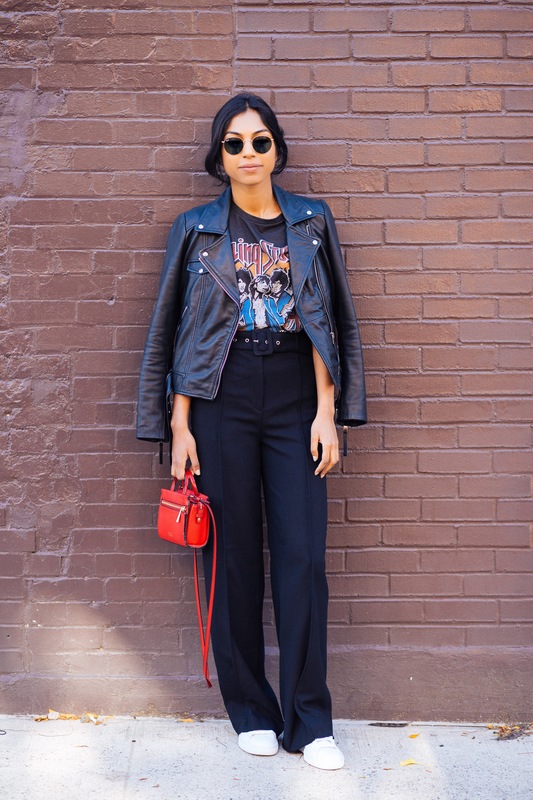 Adding my leather jacket to this look was a no – brainer. I can’t stress enough how important it is to have a solid leather jacket in your wardrobe. With the amazing styles they have now at Zara, you can get a luxe feeling jacket without an insane price tag. I love the details of this Moto one – the hardware can edge up any look. Lastly, it’s all about a clean white sneaker. I decided to give my Stan Smiths a break and go for something different. Hello, Puma’s! So comfortable and so chic – yes, it is possible. A pop of my red bag, by (now vintage) Kate Spade Saturday, and I’m ready to be snapped by the paparazzi in style. Just kidding, but hey, shouldn’t you always feel like a model walking down the street? The sidewalk is your runway. Shop the look below and be sure to follow me on Instagram, @symaspeaks, where I post even more frequently and have recently joined the Reward Style family so you can shop my looks easily and directly with LikeToKnowIt! Photos shot by Kevin Tun in Brooklyn, NY. Crisp fall weather means one thing…cozy cardigans…and lots of mocha lattes. Sundays are always filled with running countless errands around the city — instead of grabbing your go-to black leggings (which I fully support), switch things up with an oversized cardigan and a great pair of denim. I’ve been loving the two-tone denim look for a new take on your favorite pair of jeans. This pair from American Eagle Outfitters is one of the latest fits from the brand – the Vintage Hi-Rise. At first you might be confused on how to wear the two-tone style but think of them as a statement pair of jeans when you want to switch things up. I love a dramatic cardi in these cooler months. 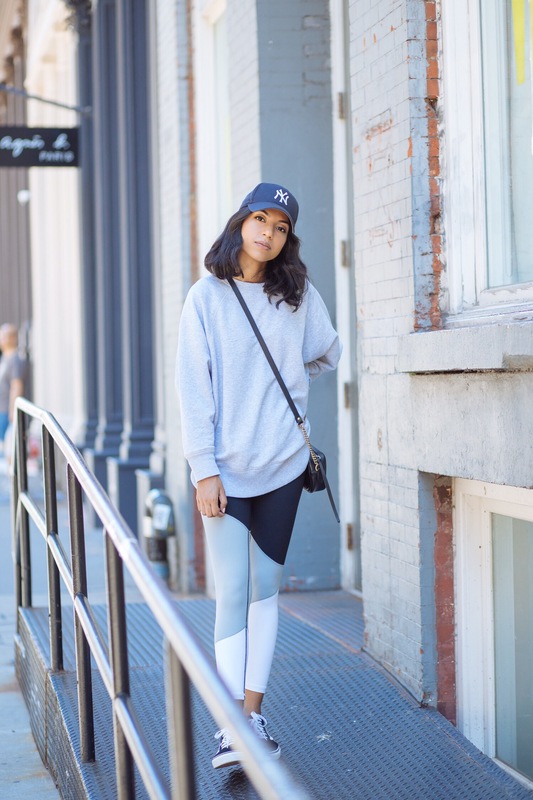 It’s easy to throw on and be comfortable but the length adds a new level of chic. Layered with a simple white tee and an addition of round Ray-Bans and gold hoop earrings, this is an easy breezy outfit to wear while checking off your to-do list and meeting up with your girls for brunch. What I wear more than anything? Grey tops + jeans. This combination will never get old to me. However, the type of silhouette of your top can take your classic t-shirt and jeans to a whole different level. Queue: the off-the-shoulder top. I’ve been obsessed with off-the-shoulder anything since last spring and I’m so excited this trend is here to stay. 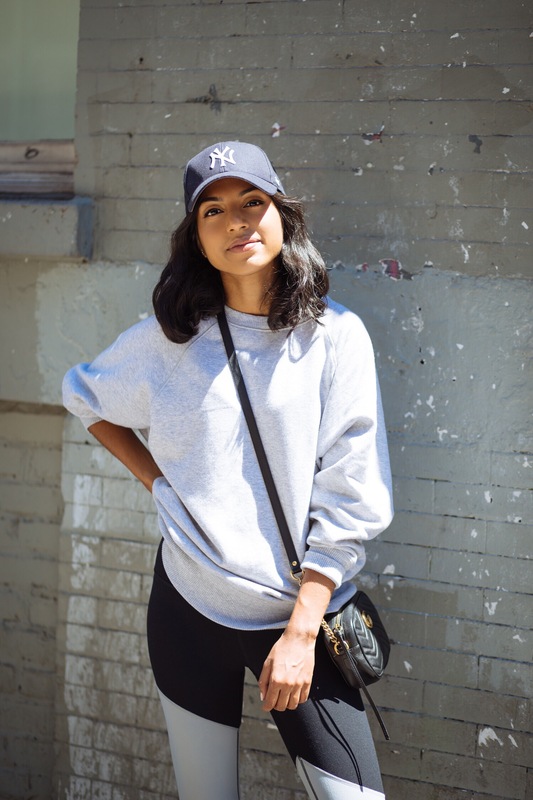 One day I was browsing one of the 100 H&M’s in NYC and there it was – the perfect update to my grey tee collection: the off-the-shoulder grey top! I envisioned another Kendall Jenner outfit recreation and had to purchase. I paired the top with my go-to high waisted American Eagle Outfitters jeans that are this amazing saturated indigo blue. These jeans seriously do not lose their shape — the Denim X technology is incredible wear after wear – I highly reccommend! Now to accessorize — I completed my look with the belt of the moment: the concho belt. I’m pretty sure my oldest sister wore this belt in high school (mid 90’s) and I kind of wish she still had it. I found this one for under 10 bucks at Forever 21 — it was a must buy! Next, I added a simple gold choker, my latest round Ray-Bans (obsessed) and my beloved Dolce Vita ankle boots. Are you ready to recreate? 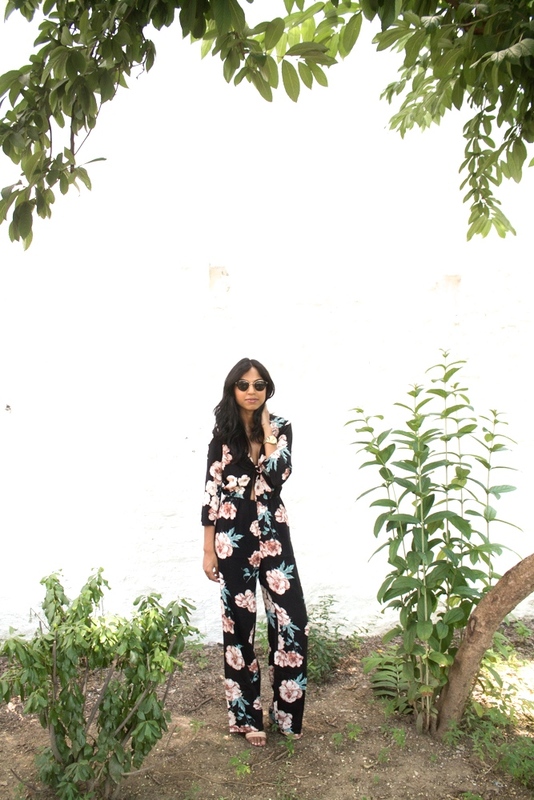 This is the 2nd jumpsuit I’ve scored at Forever 21 — I know — you’re just as shocked as I am! A full outfit for under 25 bucks?! Anything is possible people. To take this into evening and cooler temps — simply drape your favorite leather moto over your shoulders and you’re ready to take your #OOTN in style.